A few days ago I received an email from a reader. She wrote about the Veterans Memorial that once stood outside of the Town Hall, and was removed during reconstruction of the Hall. She assumed the Memorial would be returned to its original place, outside of the building, but she had learned that the monument was no more. No more monument to the veterans of Sturbridge outside of the Town Hall. The stone work was discarded, the plaques removed and attached to the walls on the second floor of the Town Hall. The front lawn of the Town Hall was cleared of everything except the flag pole. There is nothing left, and the reader wanted to know why, and what could be done to return the memorial. This was was the first I had heard of the monument not returning to its original site, and I passed along the readers email to our Veterans Agent, Tom Chamberland in hopes of getting an answer. Tom was quick with a reply, but was in the dark as much as the reader and I were. In the meantime, there seemed to be a local ground swell of anger, and disappointment that the monument was gone for good, and a petition was circulating in town wanting the Veterans Memorial restored. The petition will be circulated along the parade route on Memorial Day for people to sign to support the restoration of the Veterans Memorial. Ironic is not a strong enough word to describe that last sentence. We have all seen plaques that were once dedicated with pride relegated to some back wall when construction forced their being moved. Bronze honoring those that served in the Spanish American War hanging in a dark third floor hallway, or a plaque honoring those that served in Indochina being sentenced to the wall of the break room. It happens as a temporary fix, but is seldom if ever really fixed. Whose idea was to not restore the monument? Who decided that hanging the plaques on the second floor was memorial enough for those whose names are on those plaques? Above all, when did it become the culture of the Town of Sturbridge to make decisions,and perform actions without the input of the citizenry? Sidewalks, slate roofs, single pane windows, snow removal along our sidewalks all decided on, and on and on all decided upon at meetings, not by votes of the residents. 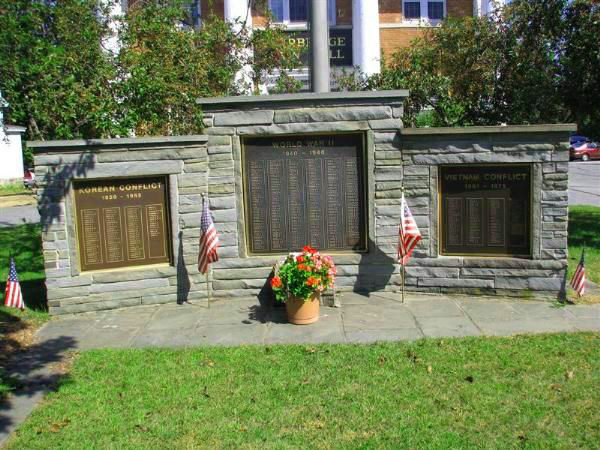 Now, the destruction of the Town of Sturbridge's Veterans Memorial, the hanging of the once proud plates of bronze on the wall in a second floor assembly room, and no one seems to know how, or why it happened. I want to refer you to Selectman Tom Creamers blog for additional information Tom has posted about this matter. Please take a moment to read it. What is happening here? Something as sacred as the monuments to those that served our country in time of conflict being torn down without a plan to rebuild them? It is not only a shame, but it is a disgrace if the Memorial is not restored. Now, with all of the above in mind, I want to ask you to view the video below. It is about the War Memorials that were recently constructed in the Town of Auburn along Route 12 in 2010. The difference between one towns honoring of its veterans, and the way those in the brick building at the corner of Main and Maple have chosen to, is a galaxy apart. I sincerely hope there are those among us with the gumption, and resolve to once again do our veterans proud. I also hope that in the coming days some answers will be obtained, and offered to the town, if not, then it is far past the time to reclaim our town from those that have such little respect for its citizenry, not to mention its veterans. "I am unclear as to what resolution can be achieved at this point, though certainly the status quo appears unsatisfactory in that the decision seems to have been made by a few, as opposed to the many. To that end, I, as an individual member of the Board, am open to any and all viable solutions." Tom, this was the "other issue" I alluded to in my previous post. Please take a minute check out the video below, and when it has finished think about what you have just read. I cannot thank you enough for your thoughtful, honest, and inspiring postings. As one who is so opposed to war as to border on pacifism, I still know that we have all been touched by war, some profoundly touched, and that there have been times when the only answer was to go to war. Who can say that they haven’t had a beloved father, mother, grandmother, grandfather, husband, wife, sister, brother, aunt, uncle, cousin, niece, nephew, boyfriend, girlfriend, neighbor, or friend in the military at wartime? War has touched us all. These people have touched us all. Some have told us their stories. Some cannot, silenced by death, or silenced by the horror they cannot speak. Think of a young person about to go to war, or in the midst of war. What thoughts are racing though that person’s mind? What fears? What feelings of patriotism? What confusion? Is that person comfortable in his or her own skin? Is that person wondering if he or she made to right decision to go into the service in the first place? Duty? Determination? Are you thinking of a person of long ago, a youngster drafted into service in wartime? What about the families they left behind? The children, some still months away from being born, who would never get to see the face of their fathers, what about them? Yes, I hate war. It’s dirty, bloody and horrible, and, oh, the suffering of innocent children who live in those war-torn countries, but being in the presence of our memorials is bittersweet, and brings back tender memories of love, sacrifice, devotion and loss. We are human beings. We have emotions. We need places to express those emotions in a proper way. Our memorials can be those places. To me those memorials bring a presence of family and friends that words cannot begin to describe. Their wars were terrible. Their love for us was great. They defended and protected us, and we are thankful and proud, and we love and honor them. I attended the war memorial discussion meeting at the senior center, and was in the presence of some of these living heroes, and felt their emotions when some of their eyes filled with tears, and I could feel the lumps in their throats as some of them spoke. They deserve better than having their names removed from the memorial and hung in dark corners. Veteran's Daughter, thank you for your eloquent words. Well said. Wally, great post and quite timely as we both have arrived at a similar place of concern, independent of one another, which in my view speaks to the importance of this issue, particularly in light of the growing dissatisfaction that is evident. I thought I would share a quote that has taken many forms and was originally uttered by Father Dennis Edward O'Brian, USMC, and subsequently reformatted by Charles M. Province. And whose coffin is draped by the flag, Who allows the protestor to burn the flag." I would ask, do we not owe them the respect of public discussions when making determinations about the manner by which we honor them? As I stated in my post, I am sure the decision to relocate the bronze plaques was well intentioned, it was however (in my view at least) mis-guided. Citizens of Sturbridge, please speak up, call your neighbors, call Town Hall, and sign petitions voicing your displeasure, if that is how you feel, about the missing monument. It's time to bring it back. I was concerned the moment Jim Malloy announced that the veterans memorial would be removed. I recall Tom Chamberlan being concerned but at an open meeting was told it would be better that the memorial plaques be put inside. I disagreed then and still do the memorial belongs back out front of the Town Hall where it can be visited 24/7. I always wondered why no one spoke up about this when it first was brought up. GLAD TO HEAR PEOPLE ARE TRYING TO GET THE MEMORIAL BACK OUTSIDE. Thanks for the info. What meeting are you referring to? What board or committee? Who was it who said that the plaques would be better off inside? Who was in attendance at the meeting? Where was it held? What were Tom Chamberland's concerns? The word around town, correct or not, is that Tom Chamberland and others took that monument down. I believe the word being used is "destroyed" the monument. I wonder, too, why more noise wasn't made at the time. One would think, if the word around town is correct, that Tom Chamberland would have fought tooth and nail to protect the monument his father built. It gets stranger and stranger. Please give us more info. Thanks for your input. I hate war. Hate it. But it happened and continues to happen, and brave and frightened people still go to war. They have their reasons. Some freely make the choice to serve. Some have few options and decide to enlist. They protect and defend us all, even those of us who think that there are very few reasons to ever, ever support war itself. “Aesthetics.” “ Didn’t look right on the lawn of the town hall.” “Detracted from the look of the town hall building.” This is the reason the War Veterans’ Monument was removed? Tell me I didn’t hear those words. Tell me others didn’t hear those words coming from the mouths of people with some power in this town. Tell me we are all dreaming. Tell me that the parade didn’t march right by the flag and the empty space where the monument used to be, and on, to the cemetery, to honor those that died. Tell me, where is our monument to honor the memories still alive in our living men and women who served in wartime, and/or the memories families still have of those who have passed on? Please don’t tell me that that monument, built by a local caring, and talented stone mason was in the way, or somehow was out of place or distracting, or somehow not worthy of its place of honor – and please don’t tell me that after spending over $5 million dollars to “refurbish” (or whatever name you care to give it) the town hall and center school, and after all the money we’ve spent for this and that, and all those extra frills, wishes, and pipe dreams, including buying and thinking about cleaning the polluted riverlands we now own - and some of us continuing to expect to pay big bucks for the proper (costing thousands) “Welcome to Sturbridge” signs for tourists,” that we can no longer take care of our own outdoor monument at the town hall! (It now looks out of place!??) At what price comes our new, “uncluttered” and cold look that some find beautiful, in a Sturbridge that not only never was, but that has had its heart removed? You don’t even want to know how it “looks” to some of us. Most excellent montage, Wally. A Veteran's Memorial Corridor is an honorable way of telling our veterans that we appreciate the freedoms they have fought to defend. I would make a donation toward it, too, if this was moved forward. But I would like to know what happened to the stone monuments that originally encased the plaques. Where are they? Requesting answers and its return. JUNE 20th at 6:35 P.M. It's about time the Town Hall listens to the voice of the citizens. Which is dearer to our hearts and to our eyes? Our slate roof, our copper, or bricks, or our monument dedicated to those we actually knew and loved who were willing to sacrifice their lives for the people of this town and country? Though I am in favor of moving the memorials outside, I’d prefer to see it taken one step further. I would like to see the memorials placed by the common, or perhaps by some of the benches placed by the Rotary club. I have dealt with similar projects before, and I know that they can be extremely expensive, and potentially a lot of red tape…but I think we can do better than simply putting the plaques back where they were in front of the town hall, perhaps for similar costs as a reinstatement of the original memorial. As I drove to Dave Brodeur’s memorial service in Auburn a few weeks ago, I was (perhaps for the first time) comforted by the prominent placement of their memorials. It’s entirely probable that the memorials resonated because I knew Dave—I ran track against him in high school, and I was one of his upperclassmen at the AF Academy--but isn’t that the point? A memorial should be more than a list of names in a hallway. Memorials remind us of people: brothers and sisters, mothers and fathers, sons and daughters, close friends and old buddies. More importantly, memorials are presented in visible places to remind others of the sacrifices that strangers made for the freedoms that we all enjoy. Beyond that, Sturbridge is a town that reveres its history, and highlights it all to see, not one that is known for hanging it in an unseen hallway. June 2, 2011 8:05 PM "
First, let me say I do not routine reply to anonymous requests, however, compassion is a true human virtue I try to practice, and given the tone of your concern let me briefly, as you requested, try to provide a reply. The stones from the monument are long gone. The plaques themselves were completely restored and refinished and now hang in places of honor alongside those of all our past veterans, in the Veterans Memorial Hall, except for those of our true patriots and minute men, an oversight that was just funded at this past annual town meeting to correct. As for the removal of the monument that action was from the very early stages of discussion as I was involved, always a part of the “plan” and at every meeting that was held on these plans this was available for residents to take note of, be it at Bd of Selectmen’s meetings, the Planning Boards site plan meetings and the TOWN MEETING (my emphasis) where all voted to approve the project. In addition as these plans were vetted and reviewed the only veteran’s organization, American Legion Post 109, whose members were the main sponsor and builders of this monument were personally contacted by me at several of their regular meetings to discuss the removal, which was approved by them, the very veterans who worked for funding and built the monument. As for Sturbridge honoring its real hero’s, let me say that Memorial Day is a day to honor those who have died, and not the living, In addition, attendance at our Memorial Day ceremonies has grown, and for safety of all, moving the concluding ceremony to the Town Common has been widely supported by many, including the Police Dept., in their concern for traffic and safety as well as the Veterans who make the commitment to participate in the parade. As you may know me, I was very involved and actually administered the construction of this monument, I worked side by side with my father, family and fellow veterans building this monument, It was a tough decision to make, however in setting my personal emotions aside, I realized that for the longer term, and for the honor of those names inscribed on these plaques, our true place of honor and protection is where they hang today, alongside the plaques of my fellow Veterans of Sturbridge. The mention in Mr. Chamberland's reply of those those he calls our "true patriots and minute men," make me wonder who he is calling our "true patriots." Calling some our "TRUE patriots," sounds like some of our friends and family "honored" at the town hall are not considered patriots?? I am sure I must be reading this incorrectly. Mr. Chamberland's reply says that this was always part of the "plan" from day one, but he doesn't say what "plan/project" he is writing about. The Town Hall/Center School plan? I don't recall seeing money set aside for this purpose in that plan. He says that this plan was vetted and approved by American Legion Post 109. How? By a vote? Where is that recorded? Who (names)voted? How many voted? The names which were on the monument are the names of many families in this town. Didn't those families deserve some consideration in the removal of the monument? It was on town property and it was owned by the town, was it not? The town paid for its upkeep, did it not? The town paid for its removal, did it not? Who actually removed it? Am I to understand that a few veterans (certainly not all of them) voted among themselves and a majority of (how many) told the town to remove the monument? Or, did "the town" tell the veterans that "the town" wanted the monument removed? Am I to believe that the people at a town meeting knowing approved this? Mr. Chamberland goes on to say that Memorial Day is to honor the dead and not the living. Tell that to a child who proudly watches her father march in uniform on Memorial Day. Isn't it healthier for her to understand that some people, including perhaps her own father, who may be going on another tour of duty, do come back from wars alive? Is her own father a "true patriot?" Doesn't she "honor" him on Memorial Day? Perhaps the day is meant for the dead, but, of course, that child is honoring her living serviceman/woman mother or dad. Mr. Chamberland told us that Rollie Hewitt was the recipient of honors on this past Memorial Day. I am happy to say that Rollie Hewitt is a living patriot/hero. We thank those veteran's who we are told built this monument, and expect that they built it for "true patriots, true heroes" and for those who still remember them. We would like to see their names brought back out where we and our children can see them. I see no mention of removing the monument in this summary of costs for the Town Hall/Center School renovations. You are nit picking. Do you really want to know how the vets agreed to the monument removal, and how? Or are you just busting nuts? I think you are just a nut buster. Go to the legion, and ask the vets yourself, and if you think they made a bad decision about the monument that honors themselves, then tell them how the messed up. Memorial Day honors the dead. Veterans Day honors all who served. basic information taught in grammar school. Tom did very well in explaining what happened. If you want the monument returned, then go public, snd work for it, snd stop busting nuts. We will be looking for answers and asking for the return of our War Veterans Monument which was destroyed/removed from the lawn of our town hall, during town hall/center school renovation, without our (the public's) proper prior knowledge/consent. Please attend.